Our Whiterook brand series mini keys and paddles have been in production since 1995, and are a favorite among QRP and portable operators. Check out this page for more info on our Pocket Mini Keys. MK-11 Pocket Spy Micro Key : Tiny & ultra portable! MK-22 Pocket Mini Telegraph Key : Our first Mini-Key product. A classic. MK-33 Mini Single Lever Paddle : Perhaps our coolest looking key! MK-44 Mini Iambic Paddle : Our #1 selling mini key. Thousands sold since 1995! MK-32 Mini Sideswiper Cootie Key : This is a special type of key for those who want to try something different. CW Mini Keys with a twist! These combine a key and paddle in one compact unit. Unique! MK-48 Mini Combo Key : Iambic Paddle & Key. MK-49 Mini Combo Key : Single Lever Paddle & Key. MK-47 Mini Combo Key : Sideswiper & Key. 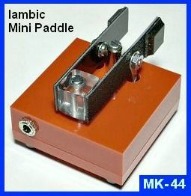 MK-64 Pocket Mini Paddle Keyer: Iambic version. 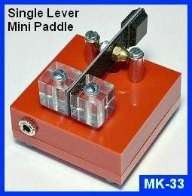 MK-65 Pocket Mini Paddle Keyer: Single Lever version. MK-60 Pocket Mini Keyer: Stand-alone TiCK keyer. Works with any paddle. MK-36 Mini Key Leg Mount: Great for portable operating! 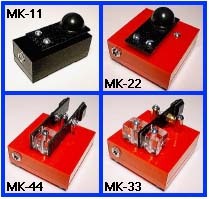 MK-42 & MK-43 Paddle Switches: Easily switch keyer paddles! Mini Key Cables: Mono and stereo audio cables in two and six foot lengths. MK-66 PL-259 Mini Center Insulator: PL-259 plug compatible. MK-67 BNC Mini Center Insulator: BNC plug compatible. A popular choice. MK-14 Antenna Insulator Set: Small & lightweight insulators for QRP antennas. LED HAM RADIO CLOCKS FOR YOUR SHACK! Keeping time is our main business. The CK-1 displays seconds and is easily settable to WWV. It is proudly in service throughout the US Military and various government agencies. But it is even more proudly in use throughout Ham Radio and SWL shacks across the USA and Canada! 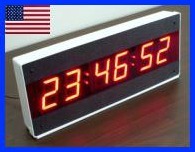 For those who enjoy electronic kits, it is also available as an easy to build Digital Clock Kit. The CK-2 displays time in ANY two time zones you choose. Available in two front panel styles: Plain or UTC. It is easily settable to WWV. Looks extremely sharp in any Ham shack! The CK-2 is proudly in service throughout the US Military. 12 or 24 Hour Clock Time Formats. Perfect for UTC / GMT. The CK-1000's unusually attractive and eye-catching LED display makes this a fine addition to any shack. 2.25 inch LED display is easy to read and looks sharp in any Ham shack. The CK-2000 is a compact two time zone clock that is shelf or wall mounted. Like all our clocks, it uses the AC line frequency for its timebase for excellent long term accuracy. The compact sized CK-26 Dual Time Zone clock displays UTC (Coordinated Universal Time, same as GMT and Zulu) hours and local hours and minutes. The local time display can be set for 12 or 24 hour operation, while the UTC display is, of course, always in 24 hour time format. The CK-26 looks great on any Ham shack desk!